The Opticron SDL v2 Zoom Eyepiece offers variable magnifications (depending which scope it is mounted on) and a comfortable eye-relief of 20-18mm. SDL eyepieces maximise the performance gains inherent in Opticron ED objective lens fieldscopes at higher powers while maintaining superior cross-field definition at all magnifications coupled with exceptional viewing comfort. With an unrivalled combination of resolution and field of view, the 40936 delivers the highest resolution of any Opticron zoom eyepiece. 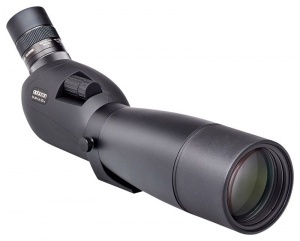 At 77mm long and weighing 270g it is a convenient addition to any Opticron scope owner's kit. The green waterproof multi-layer padded case is designed specifically to fit the ES 80 GA/45 v4 fieldscope and protects the instrument while fitted to a tripod and in use.